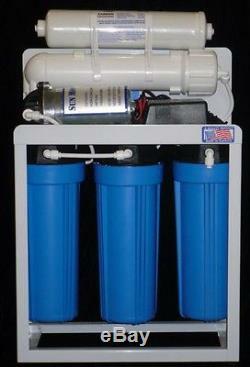 Oceanic Light Commercial Reverse Osmosis Water Filter System 300 GPD Pump USA. 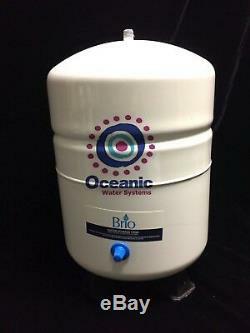 Oceanic Light Commercial Reverse Osmosis Water Filter System 300 GPD Pump. LIGHT COMMERCIAL REVERSE OSMOSIS WATER FILTER SYSTEM. Housing may be Blue or White. The color of the Filter Housing May be White or Blue (only difference between them is the color) If there is a specific Preference, please message us. Great Compact Reverse Osmosis with up to 300 GPD (gallon per Day) system. This system comes with A booster pump for better quality of water production. This is a 5 Stage System with up to 2 x 150 GPD membrane Low pressure membrane. 1st stage Sediment Filter 5 micron. 3rd Stage Carbon Block Filter 5 micron. 4th Stage Up to 2 x 150 GPD membrane low pressure membrane. 5th stage Inline post Carbon Filter 2.5 x 12 Filter for Odor reduction and Taste improvement. This System will come with Color Coded Tubing for easy installation. Comes with 14 Gallon Reverse Osmosis Tank with storage capacity of 11 gallon. Also included is Feed Water Valve, Drain Saddle Valve. Tank Valve, Filter Housing Wrench, 2 inline 1/4 Valve. This system is Frame mounted. A Great System at a Great Value. However, we are not responsible for transit time and delays. Under no circumstances are opened or used products accepted for return. Oceanic Water Systems REPRESENTS THE NEWEST, MOST EFFICIENT SYSTEMS IN THE INDUSTRY OUR LARGE PURCHASING POWER HAS MADE US ONE OF THE MOST COMPETITIVE ON THE MARKET. Oceanic Water Systems 18354 3/4 Soledad Canyon Road Canyon Country. CA 91387 661 575 0033. The item "300 GPD Light Commercial Reverse Osmosis Water Filter Pump System +14gal Tank" is in sale since Sunday, June 17, 2012. This item is in the category "Home & Garden\Kitchen, Dining & Bar\Small Kitchen Appliances\Water Purification\Water Filters". The seller is "oceanicwatersystems7" and is located in Sylmar, California. This item can be shipped to United States, Canada, United Kingdom, Denmark, Romania, Slovakia, Bulgaria, Czech republic, Finland, Hungary, Latvia, Lithuania, Malta, Estonia, Australia, Greece, Portugal, Cyprus, Slovenia, Japan, China, Sweden, South Korea, Indonesia, Taiwan, South africa, Thailand, Belgium, France, Hong Kong, Ireland, Netherlands, Poland, Spain, Italy, Germany, Austria, Bahamas, Israel, Mexico, New Zealand, Philippines, Singapore, Switzerland, Norway, Saudi arabia, Ukraine, United arab emirates, Qatar, Kuwait, Bahrain, Croatia, Malaysia, Brazil, Chile, Colombia, Costa rica, Panama, Trinidad and tobago, Guatemala, Honduras, Jamaica, Viet nam.